The quintessential cooking, style and decoration book from Soho House, the world's leading members club. In the 17 years since the first Soho House opened its doors, we've learnt a bit about what works: how to make people feel at home, how to cook food they love, how to make a room stylish but welcoming, how to throw a party, get the lighting right, mix a cocktail, design a bedroom, build an art collection. We've even learnt how to grow our own down at Babington. Eat Drink Nap, a 300-page highly illustrated book, with a foreword from founder Nick Jones, and newly commissioned photography from leading food and interiors photographers Mark Seelen and Jean Cazals, will share with readers the secrets of the Soho House way of doing things. Contemporary, global yet with something quintessentially English and homely at its heart, this is Soho House style explained by its experts: the grit and the glamour, the style and the cosiness. 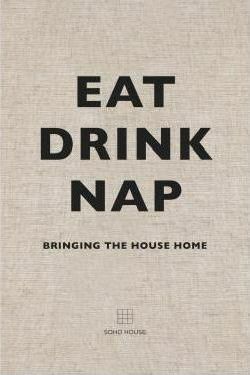 Packed with recipes and design tips, Eat Drink Nap shows how to transport a slice of Soho House living home. Whether you want to recreate your favourite house regular macaroni cheese or choose the right sofa for your sitting room, the clubs' experts will share their blueprint for stylish, contemporary living the Soho House way. "If you’re looking for inspiration for interior design, party hosting or catering, this stylish lifestyle guide is perfect… a fascinating look behind the closed doors of this celebrated private member’s club"
SOHO HOUSE was founded in London, in 1995, as a private members' club for those in film, media and creative industries.